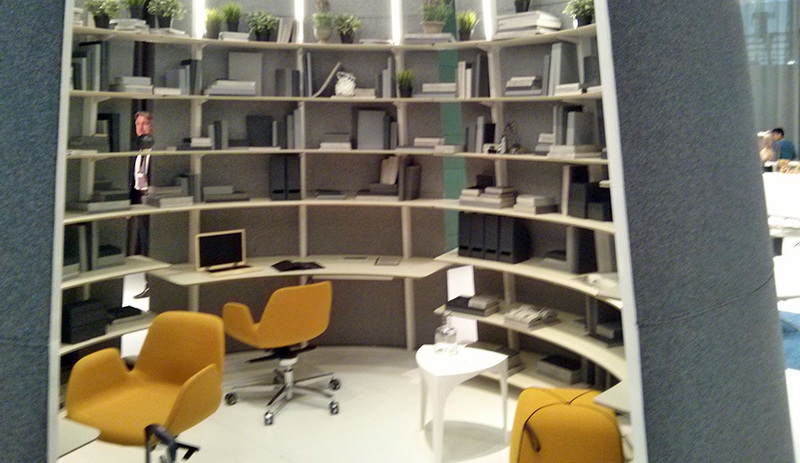 Office workspace options abound at Orgatec, the biennial contract furniture fair on now in Cologne, Germany. 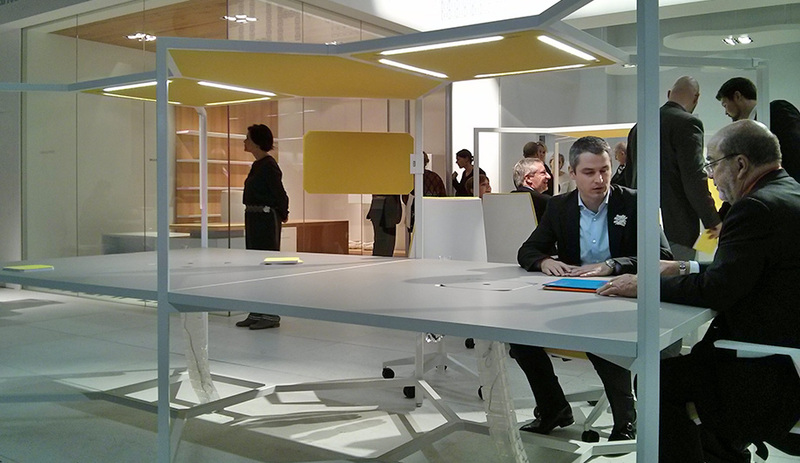 Here, we explore three new desk systems – by Fantoni, Haworth and Koleksiyon – that exemplify the changing ways we work. Like a four-poster bed or mime’s hand gestures, Hub defines an invisible cube in space without the use of walls. 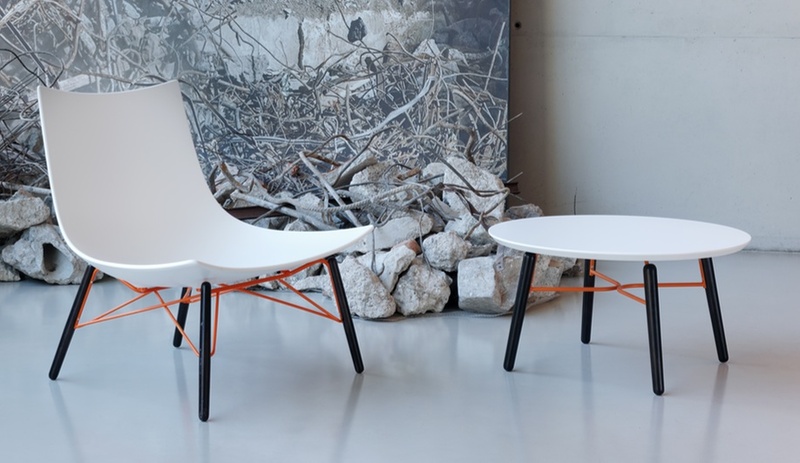 Designer Matteo Ragni conceived the desk system for flexible workplaces, where multiple employees work together but still need to carve out a mental and physical space isolated from those around them. Hub’s square plan – unusual for a desk – creates four workspaces along its perimeter, but can also be used for space-intensive collaborative activities like examining blueprints. An acoustic “ceiling” complete with embedded lighting is complemented by modular panels that affix to the pillars for added privacy. 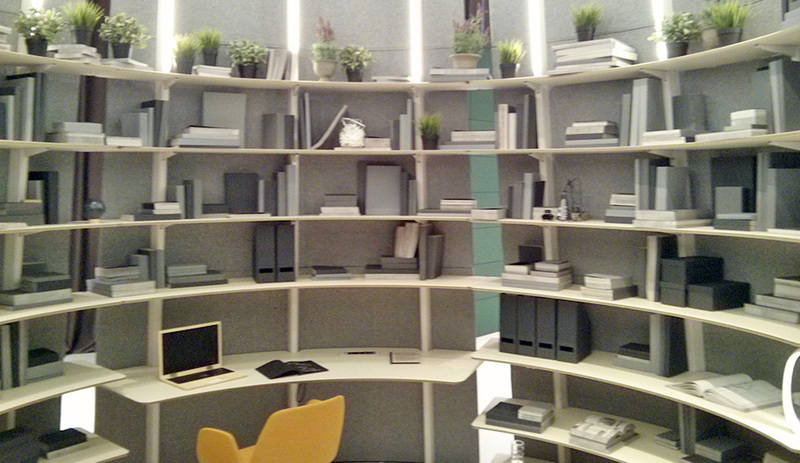 Two or more desk units can be ganged into rows of workstations. The modular units of Your Place, designed to be connected into rows of workplaces, are backed by rigid MDF panels upholstered in acoustic fabric. Bevelled at the edges to create a lighter profile, these panels are available in different heights, including curving tops that combine different heights, in addition to the horizontal version seen here. 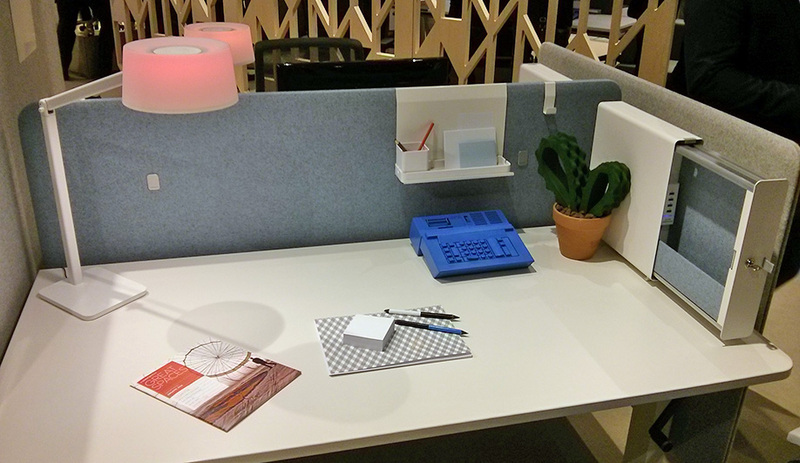 The panels’ solidity allows for accessories to be configured in several ways; task lamps and armatures for monitors, for example, can be attached directly to the back of the workstation, keeping the work surface free. A task light codeveloped with Luceplan, to be released next year, features a translucent “shade” that can be changed to different colours – red, seen here, subtly warns “do not disturb.” Haworth has also responded to specific user requests, supplying a secure box, mountable on or beneath the desktop, with a charging station inside. Imagined as a “monument in the office,” Oblivion hides its cave-like interior away from the hustle and bustle of an open plan office. The system comprises three stacking sections, offering different heights and diameters. Inside, the vertical structural beams are left exposed – they’re sturdy enough to support modular shelves and even desktops, so that no fixed elements rest directly on the floor. At the top of the enclosure, the beams are lined with dimmable LEDs that cast a soft glow; employees can control these, adjusting to their preference, via an iPad app. With its sound system, Oblivion instantly offers even the most supercharged office a retreat ideal for getting a bit of R&R, or powering through a project distraction-free.